Canada Line passengers who avoid a $5 surcharge on trips out of Vancouver Airport by paying with FareSavers will be out of luck next year if TransLink is permitted to apply the charge to those who pay with Compass card stored value. Dec. 27, 2013 8:00 a.m.
TransLink wants to make many more passengers pay a $5 surcharge to ride the Canada Line branch from Vancouver Airport to Bridgeport Station in Richmond. 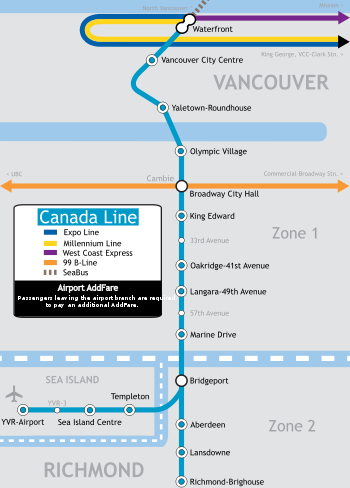 The YVR AddFare is currently charged only for Canada Line riders who pay in cash to take the rapid transit line off Sea Island. But with the introduction of the Compass card in 2014, TransLink is proposing to apply the same $5 additional fee to Compass cardholders who pay with stored value. The YVR AddFare was approved in 2010 to generate extra cash to help cover TransLink’s shortfall in funding the Canada Line to Richmond and YVR. TransLink officials say large numbers of people who now pay in cash at the airport are expected to switch to Compass cards next year, resulting in a $1.4-million drop in annual revenue if nothing is done. Extending the AddFare’s reach to more people is forecast to generate an extra $1.7 million. Many savvy transit riders dodge paying the $5 surcharge by instead buying a day pass or a booklet of FareSaver tickets from a retail outlet at the airport, instead of paying at the station ticket machines. But they’ll be out of luck once the Compass cards roll out and FareSavers are discontinued. TransLink also proposes to charge the AddFare on day passes sold on Sea Island either by retailers or from the ticket vending machines. The machines at Sea Island stations are currently disabled from offering day passes but TransLink says riders want to have the option to buy them there and are willing to pay the premium. YVR employees and Sea Island residents would be exempt from the revised AddFare, as would holders of monthly passes, U-Passes, B.C. Government bus passes and CNIB passes. The AddFare hasn’t been generating as much revenue as TransLink originally expected – the cumulative shortfall was $5.4 million at the end of 2012 and that’s forecast to grow to $12.2 million by the end of next year without changes. TransLink Commissioner Robert Irwin will make a final ruling on the application and has asked for public comment by Jan. 31. Comments can be emailed to info@translinkcommission.org.